Frozen puff pastry is one of the frozen ingredients that can be found in my fridge anytime. You can utilize it with both savory and sweet dishes. What's even better? Frozen pastry is just so easy to use. Simply remove the pastry from the freezer, cover with a moist paper towel, wait for few minutes and it'll be ready to use! 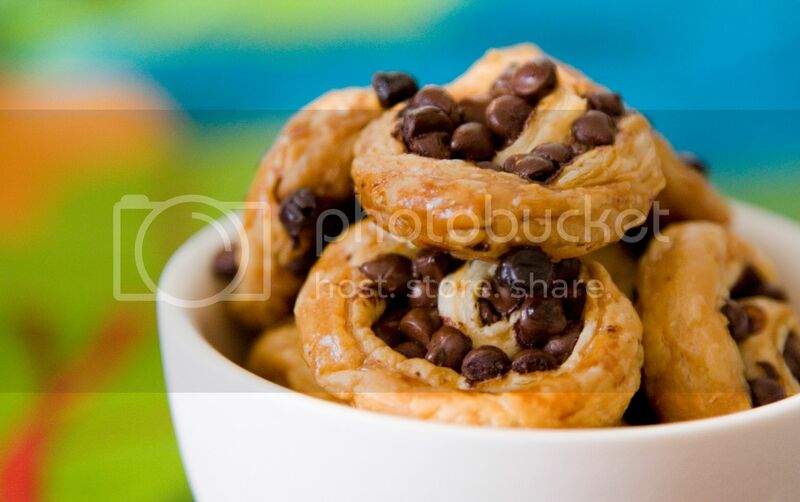 Since my recipes are so easy to make, I've decided to put up two of my recent dessert creations using frozen puff pastry, the more the merrier! Take three pre-thawed square shaped frozen puff pastries and cut them in half. 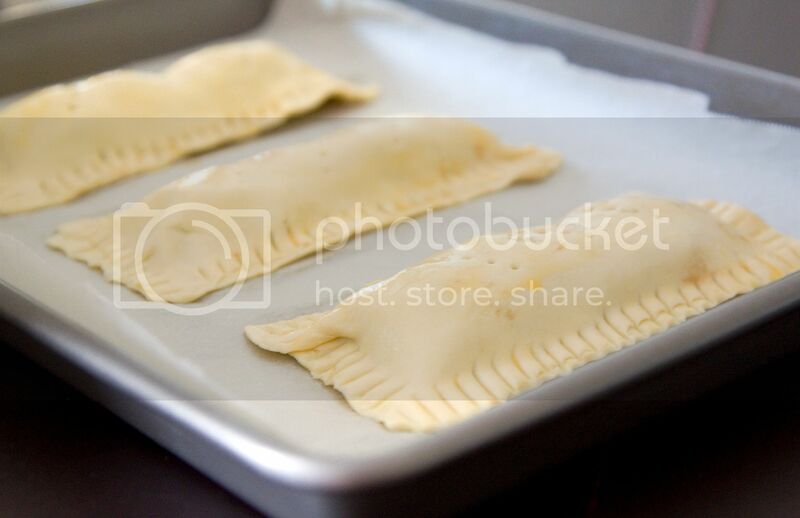 If you're using rectangle shaped pastries just cut into smaller and even rectangle pieces. Take half of the pastries and spoon some homemade red bean paste onto the center. I've hyperlinked my previous red bean paste recipe for your reference. Don't use too much red bean paste at first, otherwise you might end up with overfilled or exploded mess. Beat one egg as our egg wash. Use the egg wash and brush on the edges of the puff pastries. Take the other half of the pastries and fold it over to the ones with red bean paste on. Seal and press the edges with a fork. Also brush the top with some egg wash.
Line the baking sheet with parchment paper. Carefully transfer the Pop Tart shaped pastries onto the sheet and into the oven for 12 to 15 minutes, or till the top turns golden brown. Remember to let the finished dessert cool down before digging into it. The pastry actually gets crunchier after the heat has dissipated. To plate this dessert, I line up some semi-sweet chocolate chips on the plate and transfer to the oven till the chocolate softens. I also cut the pastry in half diagonally and dust some matcha power all over. Almost the same preparation steps. Preheat the oven to 425 degrees Fahrenheit and thaw the pastry. 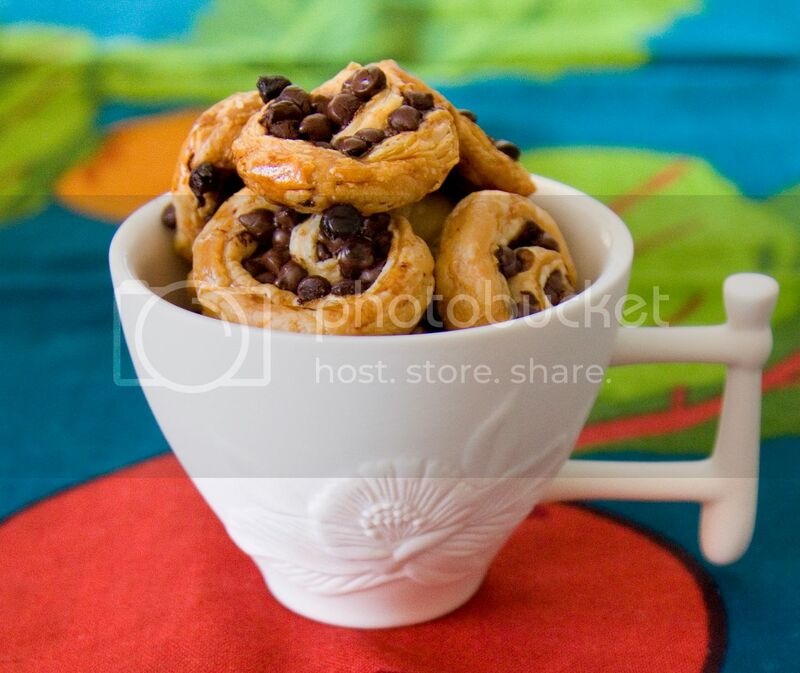 Evenly sprinkle the mini chocolate chips all over the pastry but leaving about 1 cm space on the top and bottom. Beat one egg as our egg wash and brush the bottom edge with it. Gently roll up the pastry and just seal the end by hand. Cut the pastry roll into individual pieces, about 1 to 1.5 cm in width. you can actually freeze the pastry for about 10 to 15 minutes before cutting to prevent chocolate chips from falling everywhere. Line the baking sheet with parchment paper. Transfer the rolls with cut side up, so the rolls appear flat on the sheet. They might look loose and hollow but do not worry. They'll all puffed up once baked in the oven. Brush the surface with egg wash and into the oven for 12 to 15 minutes, or till the tops turned golden brown. This is so yummy. I couldn't finish all the rolls by myself so I actually store some in the fridge. Surprisingly, the texture of the pastry remains crunchy afterwards. You can also play around with the ingredients used. Perhaps caramel? Cheese slices? Fresh berries? If I were to bake anything using puff pantry, it would have been frozen puff pantry too. 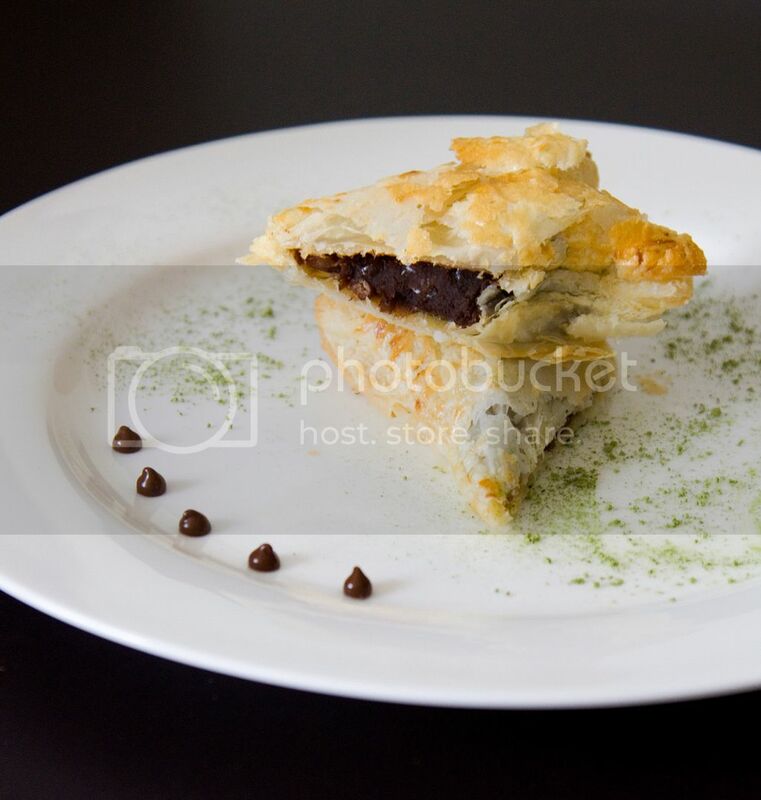 But I will do savory stuff like chicken pie, BBQ pork pastry...haha! True true, I wanna use the pastry to make chicken pei too!